One of my favorite December Sundays is the one a minister designates as “Mitten Tree Sunday.” For those who haven’t experienced this wonderful service, it begins with a Christmas tree on the chancel, empty but for some lights. Often, the Candace Christiansen story that inspired the service is told, other times different stories about giving and grace appear – told, acted out, or otherwise referenced. And then the invitation comes, and everyone has the opportunity to decorate the tree with mittens, and gloves, and hats and scarves and other cold-weather accessories. After the service, those items are donated to a group that can suitably distribute them to those in need. It is a small, but a tangible way to live out the call reflected in the Gospel of Matthew, chapter 25, verses 31-41. Which, of course is also the call of this hymn, by Jose Antonio Oliver, which is inspired by the liberation theology of Peruvian priest and theologian Gustavo Gutiérrez, which emphasizes a concern for the liberation of the oppressed. va Dios mismo en nuestro mismo caminar. we see God, here by our side, walking our way. I love this hymn. I love the lyrics, I love the sentiment, and I love the melody. It is rich, and flowing, and I find it incredibly moving. It’s not often I’m in tears from singing the morning’s hymn, but this one brings me to tears from just thinking about it, no less singing it. 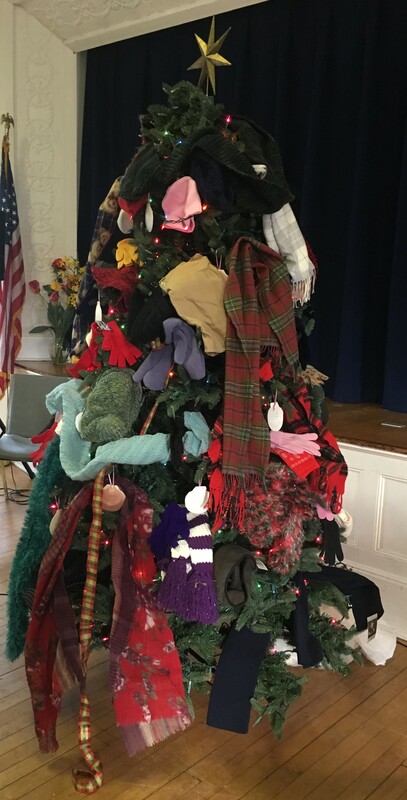 I hope congregations use this – not just on Mitten Tree Sundays but any time of the year when we need to remember that acts of simple generosity is liberation for all. Featured Photo: members of First Universalist Church of Southold, NY, decorating last year’s mitten tree. The photo at the top of this page is the completed tree. Nice the way the melody keeps unfolding without a lot of repetition, but still not too complicated for most people to learn, although for the music readers having to flip back and forth for words beyond the first verse will not help. With a little imagination this could have been set up better. My Norwegian friends have noted I sometimes like hymns that are “viser”, that is more like songs or ballads, especially ones with melodies that go somewhere and do something. There aren’t enough of them in the Norwegian “Salmebok” (hymnal) any more than there are in American hymnals. I know you have to accept compromises in an English translation–Spanish just feels different, less brittle, with a different way of bending with stress–but in the chorus to have “walk-” in the place of what is a shorter, weaker syllable in the Spanish (the second syllable of “mismo”) is unfortunate. Enough reason to make the effort to sing it in Spanish, even if all the elisions will be difficult for non-Spanish speakers!